Dominic Dromgoole’s year-long residency at London’s Vaudeville Theatre is almost over and he’s going out on a high with a crowd-pleaser that never fails to entertain. 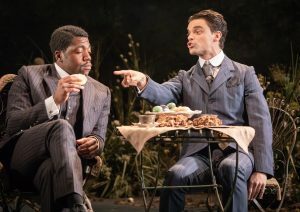 The Importance Of Being Earnest has been performed so many times, and has so many fans, that at last night’s opening, a lot of the audience could be heard mumbling its Wildean wittisms a heartbeat before the cast. But nothing could have pre-empted the hilarious performance of Sophie Thompson as Wilde’s most wonderful creation, Lady Bracknell. She, quite rightly, stole the show with one of the funniest interpretations of the old battleaxe ever. Thompson may be sparrow-like but she conjures up a majestic and powerful voice that booms forth melodically before running out of puff and leaving the star breathlessly indignant. Michael Fentiman’s riotously funny production has turned Wilde’s trivial comedy into a gloriously anarchic delight. Fehinti Balogun is quite feral as Algernon. He may have his sights set on virginal Cecily Cardew but he’s not averse to touching up best pal, Jack, lusting after a (male) gardener or, indeed giving his manservant, Lane (topping turn from stage veteran Geoffrey Freshwater), a peck on the cheek. His passion knows no bounds. Balogun, making his West End debut, cuts quite a dash as the flamboyant Algie, frequently disarming his friends and family with a charismatic smile and a bon mot. But, of course, The Importance is all bon mots. Every line is eminently quotable (and frequently is) which makes the dialogue less fluid and more statements of intent. We first meet Algie playing the piano – with an elegant flourish – in his London apartment. Best pal, Jack Worthing, calls by and there’s a bit of funny business (as in ha, ha and not peculiar) between the attentive Algernon and his manservant. But all the exposition about town mouse and country mouse, bunburying and true love, pales into insignificance when Lady Bracknell and her daughter, Gwendolen (Pippa Nixon) arrive for tea. Eccentric, partial to a drop of sherry, and a stickler for high society rules, Thompson’s Lady B almost explodes at hearing that her daughter wants to form a liaison with a piece of hand luggage – namely Jack “Earnest” Worthing, who, as we all know, was found in a handbag at Victoria Station – the Brighton line. In the second act it is Gwendolen who, obviously learning at her mother’s knee, provides the audience with the show’s second laugh-out-loud moment. She calls on Fiona Button’s determined Cecily and the pair end up fighting (with cake and bread) at cross purposes over who loves Earnest. Fentiman has sacrificed Wilde’s subtlety and satire to loosen the stays of this Victorian treat, throwing in a lot of physical comedy and a few new asides. It was refreshing and I chuckled throughout. Jacob Fortune-Lloyd makes a very earnest Earnest but he loses the battle with the rest of this larger-than-life cast who are going hell for leather for laughs. 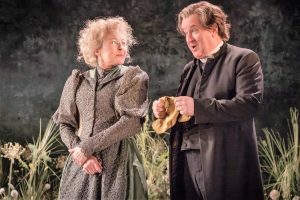 Jeremy Swift, always reliable for a comic turn, gives blessed support as Rev Chasuble but Stella Gonet has too little to do as the governess, Miss Prism. Classic Spring’s Wilde Season has been a huge success and this is a joyous, irreverent and enjoyable production to finish the run. 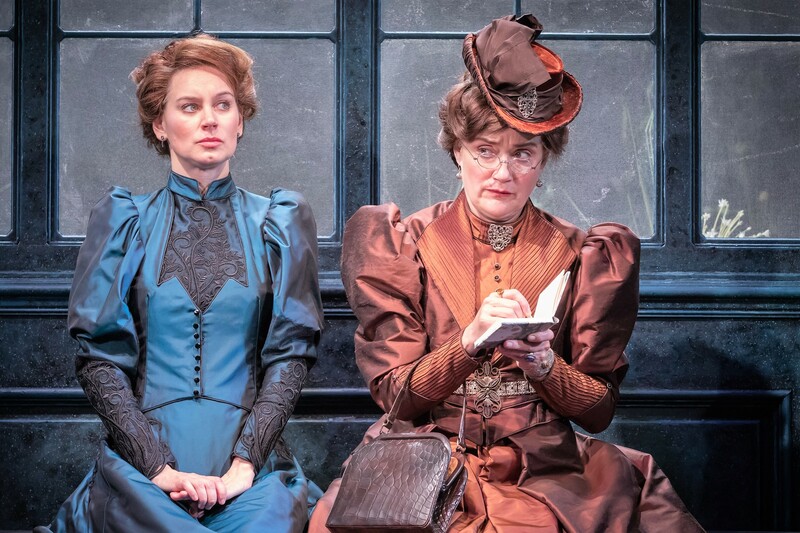 The Importance Of Being Earnest runs at the Vaudeville Theatre until October 13. Buy The Importance Of Being Earnest theatre tickets from one of our recommended theatre ticket websites. Director Michael Fentiman loosens the stays on Wilde’s subtle satire to create an anarchic, gloriously funny comedy with a terrific turn by Sophie Thompson as Lady Bracknell.